All marine life across our district is important, but there are habitats and species that are given legal protection in Marine Protected Areas (MPAs). Why have Marine Protected Areas? In MPAs marine activities are managed to protect and improve marine life. The protective effect of MPAs leads to many positive benefits to the marine environment and for people (Fig.1). Where are Marine Protected Areas in our district? There are 16 MPAs in Eastern IFCA’s district as shown in the map below. There are two main types of MPA: European Marine Sites (EMS) and Marine Conservation Zones. European Marine Sites form a network of protected areas across Europe, sometimes referred to as Natura 2000. Extensive parts of the district are within European Marine Site (EMS). Marine Conservation Zones (MCZs) form a national network of sites that protect nationally important, rare or threatened habitats or species around the English coast. 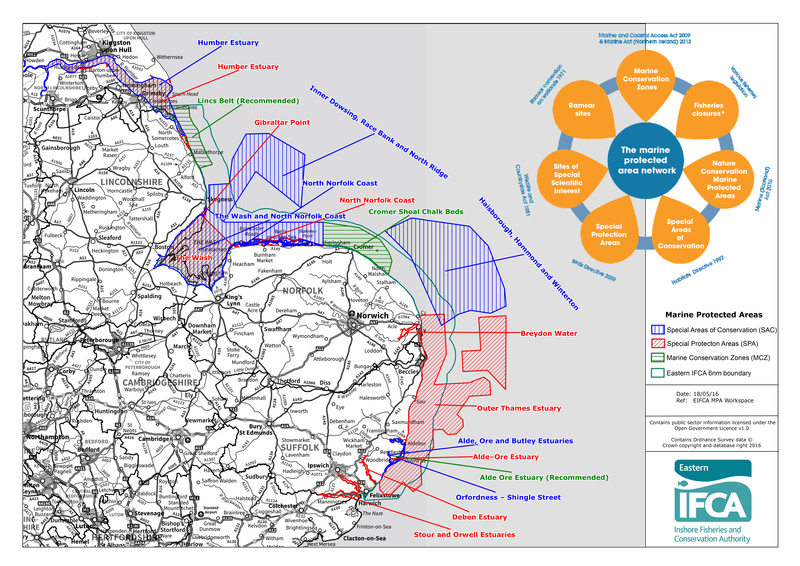 There is currently 1 Marine Conservation Zone in our district: Cromer Shoal Chalk Beds MCZ. EMS and MCZs form part of a wide network of marine protected areas around the coast of Britain. Eastern IFCA has a duty to protect the features of EMS and MCZ. In an EMS, we work hard to allow sustainable use of these sites without damaging the site. Marine life in Cromer Shoal Chalk Beds MCZ, Norfolk. 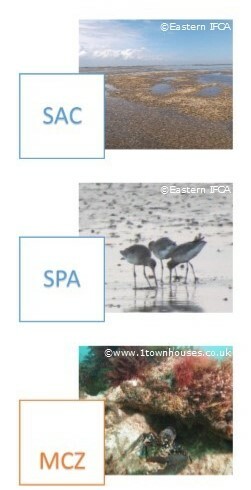 What fisheries measures have Eastern IFCA introduced in marine protected areas? our byelaws have protective effects within MPAs, for example; byelaw 3 (molluscan shellfish methods of fishing) prohibits the use of dredges without EIFCA’s consent. Each year before the annual cockle and mussel fisheries are opened, management measures are put in place through the Wash Fishery Order (1992) to ensure that fishing activities do not damage The Wash and North Norfolk Coast SAC. Eastern IFCA also introduced the Protected Areas Byelaw in May 2014. This byelaw enables Eastern IFCA to prohibit or restrict fishing activities within MPAs to protect sensitive habitats and species. There are currently prohibitions in place on bottom-towed-gear (for example beam trawls) in areas where biogenic reef occurs in The Wash. These prohibitions are put in place through a Regulatory Notice which details the area of the prohibition/restriction and the fishing activity it relates to. The table below lists the Regulatory Notices currently in place and what they protect. Regulatory Notice 4 South bank of the Humber (Lincolnshire) – Humber Estuary SAC Prohibits bottom towed gear, hand gathering (including bait digging) and crab tiling in an area of intertidal eelgrass. What additional measures are being considered? Within the district, Eastern IFCA has conducted assessments of all the fishing activity in MPAs. Where fishing may cause damage to sensitive features, management measures are to be in place by December 2016. Some fisheries have been found to have potential impacts in some MPAs. Work is underway to design and implement management measures. In particular, the Shrimp fishery in The Wash will require management measures and more information on this can be seen by clicking here. Further fisheries management measures could be required as new evidence is identified. Eastern IFCA proposes to develop a monitoring plan for each marine protected area to show how it will respond to changes in fishing activity and/or conservation advice.